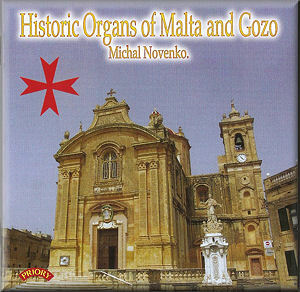 The thing to remember when listening to this excellent CD is that the organ world of Malta and Gozo is dominated by the Roman and Napoli musical tradition. I admit to believing that as the country had been a British colony between 1814 and 1964 there would be a considerable number of British-built instruments. To be fair, the Anglican St. Paul's Pro-Cathedral in Valletta does have a ‘Father’ Smith organ. However, most of the historic instruments were built in the Italian style. The present CD highlights a number of ‘Parish Churches’ all of which are Roman Catholic. The leading light of Maltese organ building is Robert Buhagiar. After taking a degree in Electrical Engineering at the University of Malta, he served an apprenticeship with Masciono Organi, which is the oldest surviving Italian organ builder. Since his return to Malta in 1998, Buhagiar has restored and re-voiced more than twenty organs, including most of the organs featured on this recording. The CD gets off to a great start with three pieces played on the one-manual Mdina Cathedral organ. This was built by Rossi in 1774. Alessandro Scarlatti’s sonata-like ‘Toccata settima’ sounds well on this small instrument. The charming ‘Ligatura per organ’ is by Carlo Cotumacci who was a pupil of Scarlatti. The final piece from Mdina is an enjoyable Canzona by Girolamo Frescobaldi. The tone of the stops used in this piece is delightful. Qrendi is an old village in to the south-west of the capital Valetta. The parish church is baroque and the organ is Neapolitan, built by Severino and installed in 1778. It is located in a small loft at the east end of the church behind the High Altar. The pedal board has no independent stops and is permanently coupled to the single manual. Two works by Frescobaldi reveal just how impressive the sound of this petite instrument can be. The ‘Toccata per elevazione’ is particularly charming. The next organ in the track listings is located at the Oratory of the Holy Cross, Cospicua Parish Church on the east side of Valetta. Restored in 2009, this is another ‘bijou’ instrument. It is certainly not possible to play ‘warhorses’ on this organ, however the tone is particularly bright because of the 4' foundation stop. The two pieces by Domenco Zipoli are ideally suited to this sound. The present organist contributes a short ‘Pastoral Improvisation’ that is effective. Another work by Novenko begins the exploration of the large instrument at the Rotunda of Mosta. This church was lucky to survive a direct hit from a German bomb in 1942. Fortunately, the forced-labour weapons manufacturers in German-occupied Czechoslovakia had sabotaged it. The organ was built in 1885 by Inzoli of Crema, Italy: it is the largest instrument in the Maltese Islands. I am not sure about the musical value of Novenko’s ‘Carillon Prelude’; however, it does let the listener hear the fine campanelli. Padre Davide da Bergamo’s ‘Elevazione’ is a powerful work that the liner notes rightly point out is far removed from the usual mystic style associated with a piece typically used at the consecration of the Body and Blood of Christ. I enjoyed the lively Verso in G and dignified Verso Marcia by Giuseppe Cerruti. They sound like something heard on a fairground organ. Excellent sound. The next two instruments are on the island of Gozo. Fontana Parish Church organ dates from 1908 and was built by the Sicilian organ builder Laudani e Giudici. It is a well-balanced organ that has ‘colour and brightness’ rather than ‘power’. Novenko plays another, more typical, ‘Elevazione’ – this time by Luigi Bottazzo, who hailed from Padova. This is followed by the same composer’s rather operatic ‘March religioso’. The other representative instrument from Gozo is the much larger organ in Nadur Parish Church. This was built in 1897 by Inzoli. The delightful ‘6 versi in D’ by Giuseppe Garibaldi is a sheer delight: look out for the lovely ‘flauto soprani’. This organ has an engaging sound and includes ‘string’ stops. The final venue is Naxxar Parish church which lies to the north-west of Valletta. It is an example of a Sicilian organ built by Santucci in 1775. It has been heavily restored but has retained much of the original pipework. Two works are performed here. The first is a short ‘Pastorale’ by Francesco Azzopardi that is one of the few pieces of organ music to have been composed in Malta. The final work is the ‘Sonata 85 in C’ by Vincenzo Panerai. This is a great, lively piece that would sound just as good on the piano. It concludes this excellent tour of the organs of Maltese churches. The playing by Czech-born Michal Novenko is impressive. He is able to tailor his style to suit the idiosyncrasies of each organ. The CD booklet is excellent. All the composers featured are given brief biographies with notes about their music. As essential for all organ recordings there are full specifications given for all eight instruments. Included are a number of excellent black and white photographs of each instrument. Most telling of all, a picture of the Cospicua Oratory organ before restoration features on the back cover. It literally looks as if a bomb has hit it. Full credit to Mr Buhagiar for rebuilding this! I enjoyed every note in this new Priory release. It is always fascinating to hear a variety of different instruments. It is good to know that there is a fine selection of organs present and correct in Malta and Gozo. There is certainly scope for future recordings. There are more than 360 churches on these islands however, I understand that not all of them have viable instruments. Nevertheless, with the sterling work of the local organ builder, there seems to an ever-growing number of possibilities.